Since 2011 is the sesquicentennial of the Civil War, we thought it might be interesting to take yet another look at those events. But instead of rehashing what has already been rehashed over and over, we thought that we might take a slightly different perspective and look at what was going on on the home front. In 1861, there were two weekly publications in the towns of Winston and Salem. The Peoples Press, founded by the sons of Christian Blum in 1851, represented the Whig viewpoint dating back to the founding of the nation. The Western Sentinel represented the somewhat newer views of the Democratic party, established by Andrew Jackson in the 1820s. We have microfilm of both newspapers. Unfortunately, the run of the Western Sentinel is badly broken. The run of the Peoples Press is much more complete. So this series will mostly reflect the views of the Peoples Press, which is not so bad, because the Whig view was the more moderate view. There would not be a local newspaper representing the more radical Republican view until after the war. When the Western Sentinel is available, we will include relevant items from that paper. What we hope to achieve is a feel for what it was like living in the two towns during America’s most dramatic and pivotal years. As the momentous year of 1860 advanced toward the November election, the 1000 or so citizens of the towns of Winston and Salem and their few thousand rural neighbors watched uneasily. They had their own local problems. The North Carolina Railroad had been essentially completed. It ran westward from Wilmington to Fayetteville, Raleigh and Greensboro, then turned southwestward to Lexington, Salisbury and Charlotte. Without a rail link, they would remain the backwoods community that they already were. And now there was talk of secession from the Union. That could bring about the kind of economic disaster that could ultimately obliterate the two small towns. The principal issue was slavery, which was not much of an issue locally. 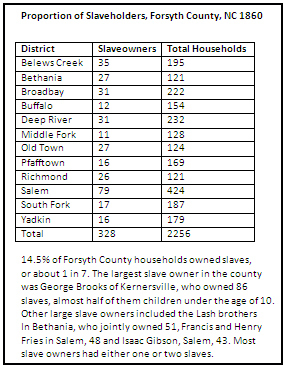 The population of the South as a whole was about ⅓ slaves. But that ratio was much heavier in the deep South, especially in neighboring South Carolina, where slaves outnumbered free men. North Carolina and Virginia conformed to the regional average. But in Forsyth County, and most of the Piedmont, the ratio was much lower. On November 6, Abraham Lincoln, the candidate of the new Republican Party, was elected President of the United States. The campaign had made it clear that a Republican victory would weaken the influence of the slave states. So talk of secession increased, while Congress sought desperately to find a compromise that would cool such talk. There was little if any success. On December 20, South Carolina officially seceded from the Union. They immediately demanded surrender of all Federal property in the state. Having anticipated this development, and the fact that communications with the Charleston harbor fort complex might be broken, the US Army had replaced the commander of the forts in the Charleston area with Major Robert Anderson, a man known for his wisdom and discretion, who might have to make decisions on his own. He wasted no time. On the day after Christmas, under cover of darkness, he abandoned the indefensible forts in the area and moved all of his troops into Fort Sumter, on an island unapproachable by land. That sent the South Carolinians into a fury, because they realized that Major Anderson intended to defend the fort. And it may have finally awakened the residents of Forsyth County to action, because 3 days later, on December 29, they called for a public meeting at the courthouse to discuss the problem. Of course, there had been much discourse already amongst the locals. Some were avid secessionists. Some were not. Most were middle grounders. There had been bitter debates, even some name calling. The People’s Press had cautioned citizens more than once to “watch their tongues”, that the name calling and divisiveness could have very negative consequences for the community. Now, perhaps, it would all be settled. 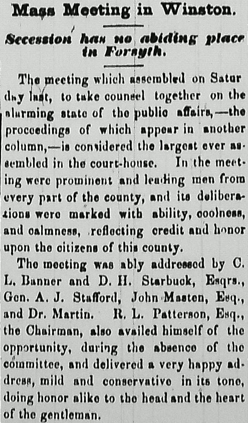 On motion of Darius H. Starbuck, a Winston resident and the U.S. Attorney for North Carolina, a committee of fifteen was appointed by the chair to draft resolutions for the action of the meeting. The committee consisted of Thomas J. Wilson, Joseph Masten, D.H. Starbuck, John A. Styers, R.W. Wharton, John Boyer, John Blackburn, John Alspaugh, Dr. T.F. Keehln, John Watson, Dr. Beverly Jones, John M. Stafford, George V. Fulp, John G. Hill and Sandy Flynt. Two hours later the committee returned with eleven resolutions. Most merely rehashed the national concerns regarding fugitive slaves and local militias, with one suggesting that high tariffs be levied against certain other states which were uncooperative on the matter of returning fugitive slaves. But it was resolution #4 that cut to the heart of the matter. The final resolution provided for publication of the resolutions in the local newspapers and their transmission to the state legislature and the national congress. The document was signed by Patterson and the two secretaries of the meeting, A.J. Stafford and C.L. Banner. So South Carolina had already seceded. Mississippi might soon. And others might follow. But not North Carolina…not if the citizens of Salem and Winston and the rest of Forsyth County could help it. 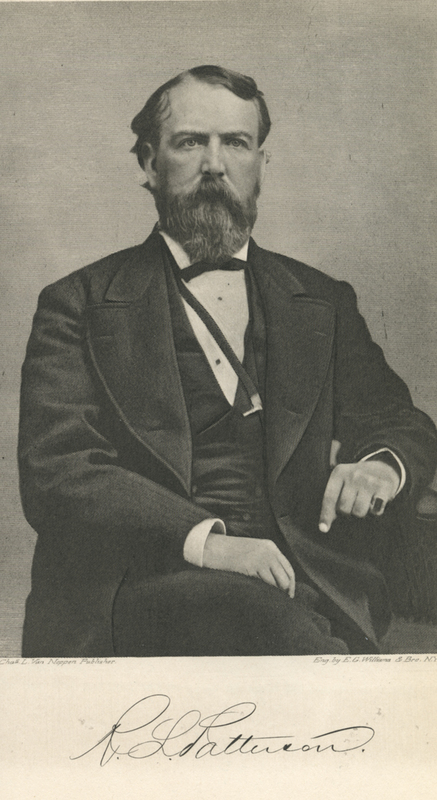 Rufus Patterson, chair of the December 29, 1860 mass meeting. Isn’t it interesting that political “divisiveness” and “name calling” are noted as having negative consequesces for the community? The same is in our national news this week. That sounds like a Quaker talking! Thank you Cindy and Kathleen for your comments. For an excellent account of the Moravian struggle with slavery, see Jon Sensbach’s book “A Separate Canaan”, both uplifting and heartbreaking. 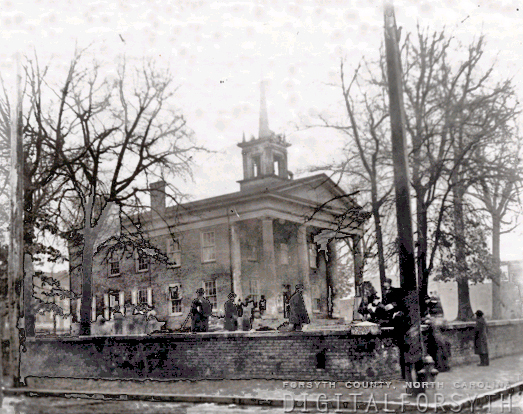 Since the western half of Guilford County, including Greensboro and High Point, was steeped in Quakerism, there can be little doubt that that had a significant influence on attitudes toward slavery. And the Quaker influence was quite strong in Yadkin County as well. In fact, the farther west you traveled from the Yadkin River, the farther you traveled from secessionist sentiment. Yadkin and Wilkes counties became havens for Confederate deserters. And Ashe County, on Wilkes’ northwestern border, had its own bloody Civil War, with local Unionists pitted against local Secessionists in their own little armed conflict. For more on that, see Martin Crawford’s “Ashe County’s Civil War : community and society in the Appalachian South”. As a graduate of a Quaker College, I know all about “counseling together”. The Quakers are well aware of the dangers of democracy, so everything must be decided by consensus, a far more difficult path to making the right decision. That may explain why we have so much name calling nowadays. Very late, but wanted to say thank you for this. Happened on it while researching Guilford County’s Quaker roots and the surrounding developments regarding the secessionist movement. Well written and sourced, thanks again! !